Trumpeter Roy Hargrove, a prolific player who provided his jazz sound to records across a vast range of styles and won two Grammys, has died at age 49 after a long fight with kidney disease. 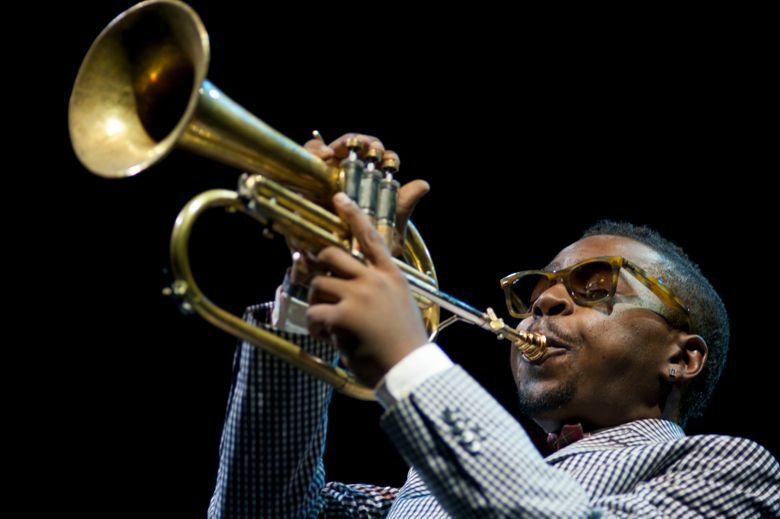 Roy Hargrove, a Grammy-winning jazz trumpeter who shifted from one style of music to another, exploring Cuban and electronic music, R&B and hip-hop while performing with artists as diverse as Dizzy Gillespie, Stevie Wonder and Common, died Nov. 2 at a hospital in New York. He was 49. He had complications from kidney disease, said his manager, Larry Clothier. Hargrove emerged as a fully formed talent in his teens, gaining an early boost from his fellow trumpeter Wynton Marsalis and appeared on bandstands with bebop pioneer Gillespie while still in high school in Texas. Only 20 when he released his first album, Hargrove was heralded as the leading light of the “Young Lions” movement, a new generation of musicians deeply schooled in the tradition of Duke Ellington, Charlie Parker, Art Blakey and other jazz pioneers. At 21, Hargrove joined saxophonist Sonny Rollins in a concert at New York’s Carnegie Hall. Rollins had been a bandmate in the 1950s with trumpeter Clifford Brown, who was Hargrove’s musical idol. By 1994, Hargrove was regularly ranking at the top of critics’ and readers’ polls in jazz magazines. His recording that year, “With the Tenors of Our Time,” which featured him with such master saxophonists as Joe Henderson, Johnny Griffin and Branford Marsalis, sold more than 100,000 copies, an extraordinary number for a mainstream jazz album. Always restless and never content to stay in one musical groove, Hargrove branched out to other styles without forsaking his roots in jazz. Elements of rhythm-and-blues, soul, gospel and hip-hop were soon reflected in his performances. He won his first Grammy Award in for his 1997 album “Habana,” in which he brought Cuban and American musicians together for a hypnotic style of Cuban-flavored jazz. His second Grammy came for the 2002 album “Directions in Music: Live at Massey Hall,” a straightforward jazz performance featuring Hargrove with Herbie Hancock on piano and Michael Brecker on tenor saxophone. Beginning in the 1990s, Hargrove often made guest appearances on the recordings of other artists, including Washington guitarist Danny Gatton, hip-hop performer Common and neo-soul singers D’Angelo and Erykah Badu – a schoolmate from Dallas. In 2003, Hargrove launched a band called RH Factor, which added cascading layers of funk, soul and of electronic music to his blistering jazz riffs. Among the performers who appeared on his genre-crossing albums were D’Angelo, Q-Tip, Meshell Ndegeocello and Badu. Roy Anthony Hargrove was born Oct. 16, 1969, in Waco, Texas. He lived with relatives in the small town of Mart, Texas, before moving to Dallasl when he was 8 and his father was discharged from the Air Force. Both of his parents were musically inclined, and young Roy was 9 when he began playing a cornet his father bought at a pawn shop. He was recognized as a prodigy and attended a high school for the performing arts in Dallas. His teachers introduced him to the recordings of Brown, Fats Navarro, Miles Davis and other jazz trumpeters, and at 17 he met Marsalis, who came to the school for a clinic. Marsalis helped arrange for private lessons, and Hargrove was soon appearing with major jazz stars. He studied at the Berklee College of Music in Boston before moving to New York. He released more than dozen albums by the time he was 30. Several of them, including “Diamond in the Rough” (1990), “Of Kindred Souls” (1993), “With the Tenors of Out Time” (1994) “Approaching Standards” (1995) and “Parker’s Mood” (1995), were acclaimed as among the finest jazz recordings of their time. In 2014, Hargrove was convicted of cocaine possession in New York. He had been on dialysis for 13 years, his manager, Clothier, said. Survivors include his wife of about a year, Aida Brandes of New York; a daughter from an earlier relationship, Kamala Hargrove of New York; his mother, Jacklyn Hargrove of Dallas; and a brother. Hargrove maintained three working bands until his death: RH Factor, a 21-piece big band and an acoustic jazz quintet, with which he was scheduled to appear this week at Blues Alley in Georgetown. For all his adventurousness, he never abandoned jazz but saw different styles of music as part of a intertwined rainbow of expression.